I would like to introduce Monet to my fellow bloggers. He is an 8 week old Shih-Tzu pup. He weighs 1lb 8oz. He is bringing such joy and happiness to Mike and Me. It has been a year since we lost our Shiloh Shep. Mac. He is quite the opposite of our 125lb. 30in. Mac. He is our Christmas Joy. With our children all grown and thank God happy and healthy with children of their own, our home is now filled the fun and yes work that this little guy brings. So from our home to yours we are wishing all of you and very Merry Christmas and Healthy Happy New Year. Good morning fellow bloggers. So happy to hear the weather report, we are indeed getting some of the white stuff. Don't know why I love it so much, it brings back memories of my childhood and loving being out there frolicking with friends. Of course not wishing for a blizzard, just enough of the pretty stuff for safe travel. Happy Painting everyone. My good friend Vic has always inspired me . After seeing his post, thought it would be a good idea to post what I did while visiting my daughters family. It was great being with the granchildren. My little grandaughter had to go to the ER this morning, thank God, it was just a stomach virus. Mike and I returned home this afternoon, the trip was easy, no traffic. So we are back to our own routine and looking forward to getting my little puppy on Dec. 17th. In the meantime, I will try to post more often and visit my blogger friends. Happy Painting. Just want to wish all my blogger friends in the U.S. a very Happy Thanksgiving. To all my blogger friends in other friends in Canada and England a very Happy Day. Today is a day to reflect on all our blessings. As I write, my grand daughter Virginia is creating a bracelet on her rainbow loom. The little guy Joseph is sitting on his dads lap with his traditional Thanksgiving cold. My husband is in his glory, with the shopping for the feast, bonding with my daughter for she also loves all the traditions from holidays past when her grandparents came to our house. My sister in law is the life of the party, making the kids laugh and playing games. My first born grandson is sleeping, which is unusual for he is an early riser. For me I cherish everyday with my loved ones, and not to mention, the wonderful gift of art. For that is what keeps me going when we can't all be together. Happy Painting Everyone. Saturday I stayed home and painted a scene that was started plein air. The Bayard Cutting Arboretum is such a lovely place to paint. Although it wasn't completed I did walk away with enough of the information needed to work on a larger piece at home. Mike and I went to Montauk Point with our grandson, at the time he was only 18mos. He loved the water and big rocks and for a little guy he enjoyed the task of lifting and and re-arranging them. So many years ago, he is 10 yrs old now. Where has the time gone. During the week the ladies and I painted at Meadow Croft. While it is impossible to paint the marsh, because of the road leading to the estate, had to take photos to work from, this is a 5x7 acrylic on RayMar panel. Trying to complete works started in the beginning of the summer, finished this one in the studio. 11x14 acrylic on mdf board. Do hope all of you are enjoying the last days of August. Don't know what it is about the changing seasons that bring me so much joy and anticipation. Cool crisp days , natures beautiful display of fall colors, pot roast, apple pie and okay, brownies. So to my fellow bloggers enjoy life, and Happy Painting to All. Today was a plein air day, life is almost back to normal. Last week was so very hectic and I just wanted to get back to painting. I miss blogging with all of you and in the future will try to get back to visiting and sharing with all of you wonderful artist. We painted at Meadowcroft and I started two 8x10 oil sketches. To be honest, it may be time to get back into the studio and start finishing all of these paintings started on location. I would also like to paint larger and maybe get back to life drawing workshops in September. What is it about the fall that makes me think of a new beginning, like the start of a new school year. Oh Well, it time for a bit of RR, Happy Painting everyone. The last painting done at the Planting Fields before closing, I did this in one hour. The Play House, I mostly wanted to paint this charming little cottage, this is where the Coe's grandchildren played. the manor house and grounds were owned by the Coe family. Mike actually did a tour of the house and got all the historical facts while I painted. Almost complete, it was a thrill to be able to complete a plein air sketch on locations. That was the rule, it was a two day event and all work had to be completed on location. This was the painting selected by the judge to be hung in the Oyster Bay Historical Society building for the judging of all painting selected, I did not win one of the three awards, first $1000. and $750. in art supplies, the second $350. in art supplies, and the third $250. 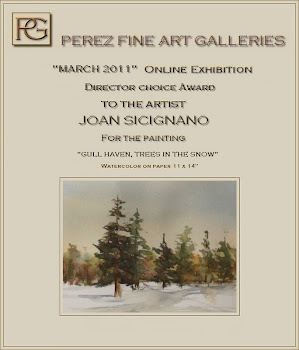 I didn't win, but I feel as though just being among the 35 artist selected for the event was a great honor. Yesterday's plein air is just what was needed to wash the blues away. My daughter and her family returned home on Sunday. After being with them this past weekend it takes awhile to get back on course. So yesterday was wonderful. We went to Briar Farms and I painted part of this lovely house. It needs to be completed in the studio. I have so many photos of the gardens and gazebo and bird houses, can't wait to start. Happy Painting everyone. Tomatoes and basil from my neighbors garden last year. Oil, 8x10 on canvas board. Today was not a good day for plein air painting. So I did this 8x10 oil on canvas panel. It is from a photo taken last summer at Stony Brook. On Tuesday evening I had the pleasure to see Paul Bachem demo at the Suburban Art League. I have been a long time admirer of Paul's landscape paintings. He is a well know artist ,who lives on Long Island. He initially started as an illustrator and is probably know for his book cover of the Godfather and many others. Well long story short, Paul has been a landscape artist and paints plein air. We are fortunate to have him here on Long Island. So I finally got to see him in person and see his process and approach of a landscape. It was inspiring and the very next day my friend and I painted at the arboretum. My very first attempt at painting fog in plein air. It was so much fun. Initially I set up on the same side of the dock with my friends, only to be greeted by tiny little birds that didn't enjoy my company. So hence, they won the battle and I moved to a location where my fellow artist could be included in my sketch. In turned out, that the wee birds had their feeding station where my set up was located. Must confess that I have a phobia regarding the little feather creatures. I am getting better just being out there in their habitat. Overcame my fear of geese, my daughter told me to pretend they are medium size dogs, so , geese, seagulls and swans are no longer on my phobia list. Don't get me wrong, I appreciate their beauty, oh, yes, made friends with a robin, who likes to keep me company while I paint in the yard. Enough of my silliness, it was a great day painting fog. Happy painting everyone. It was a wonderful show, beautiful location, very kind people and talented artist. But the best surprise of all, was my blogger friend Hilda came. I am only sorry we didn't take a picture together. She is one lovely lady to come out even though she is very busy with her family and her art.. Hilda, thank you. Happy Painting everyone. I am off to the Sayville Maritime Museum to paint the fog. Oh, I sold, forgot to mention that, the economy is turning around.